Cats love looking out the window, particularly if they are not allowed outside. Cat window perches bring the outdoors in, while your cat remains safely indoors. From their cat window perch, cats can leisurely watch the world go by. A window cat perch makes a great cat lover gift whether you are buying the present for your kitty or for the kitty of any cat lover on your list. There are many reasons and advantages to having a window cat perch. Most importantly, your kitty will love it! Here's are some advantages to consider. Your cat will be able to safely monitor outside activity. Kitty will enjoy soaking up the sun while enjoying the view. She can look at birds, squirrels, insects, and even dogs, from the comfort of her home. A window perch makes a perfect spot to take a nap and hang out. 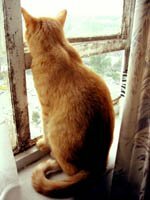 Even if you have an outdoor cat, you can bring him inside during those cold winter days and he can still check out what’s going on outside. He won't miss any of the action! Looking for a window perch for your cat and don't know where to start? Here are some useful tips to help you in your search. If you’re not that handy (like me), you can find window perches that are easy to install. Make sure it supports the weight of your cat. Choose a window cat perch that can be adjusted to fit any window with sills. You can find perches that are easy to mount onto any windowsill. Many window cat perches on the market do not require tools to assemble. Make sure that the window perch is properly installed. The window should also be secured to prevent you cats from jumping out. Window perches come in different colors. For extra comfort, get kitty a padded window perch. Get a heated cat perch for those cold winter days. If you prefer an easy-to-clean window perch, choose one with a washable cover.